As per Jason’s comment, with a new ILO4 update HP apparently has fixed an issue related to booting from SD cards. Whether this is the same issue is unclear though since the original KB article I linked to has not been updated. 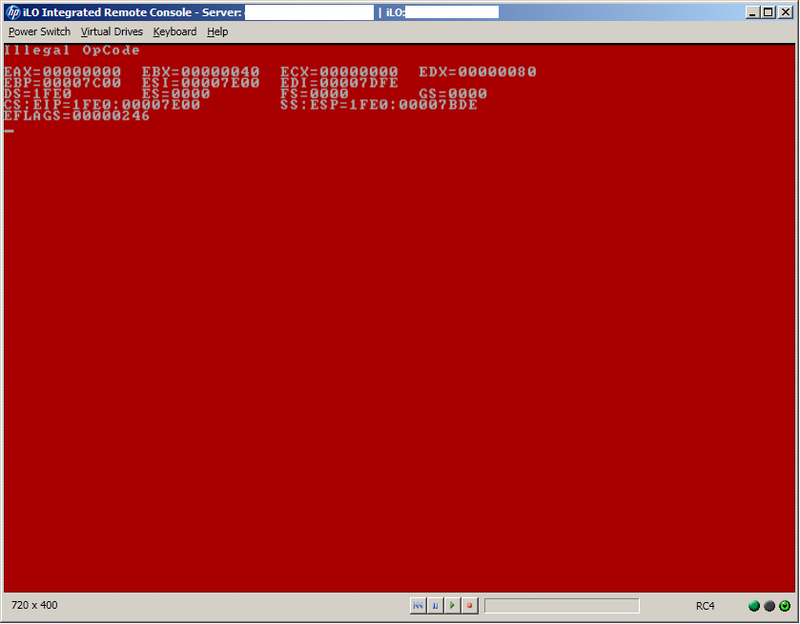 Important note: The general symptom of such a Red Screen of Death described here is NOT specific to ESXi or booting from SD cards in general. It can happen with Windows, Linux or any other OS as well as other boot media such as normal disks/RAID arrays, if the server has a problem booting from this device (broken boot sector/partition/boot loader etc). I reset the server several times via iLO but the issue persisted and I had no idea what exactly went bonkers here. Then I decided to boot a Linux live image, which worked fine, narrowing down the issue to the OS installation (device) itself. I thought the updates corrupted the installation but that actually wasn’t the case. When attempting to mount the SD card USB drive from within the live Linux I noticed it was actually completely absent from the system. The USB bus was still ok, but lsusb showed no SD card reader device in the system at all! After the ridiculous mess HP caused with their last updates to the custom ESXi extensions back in January/Febuary, HP released new updates to the HP CIM providers a few days ago. This update is fixing the issue that was probably responsible for all of these woes: HP SmartArray RAID Conrollers displaying a random warning message. HP actually pulled the updates (which were titled “February” updates) from their VIBs Depot site and purged the references from the depot metadata indexes as well. I’m not sure what’s going on but you won’t be able to apply these updates (via Update Manager) unless you downloaded them already. But even if you did, you should refrain from using these bundles at this time. Unfortunately there seems to be no way of properly removing them from Update Manager if it pulled the metadata already. HP actually removed the re-released updates from the vibsdepot yet again?! I’m speechless in the face of this unprecedented fail. Uh-oh, the updates SEEM to be back at http://vibsdepot.hp.com/hpq/feb2013/. File dates are from Jan 4th and the bundles md5sums match the ones from the initial release mid-January (which this post was about) exactly. So if there really was a bug with the release, it must still be there. Taking bets on how long it’ll take HP to offline them again. The issue with the SmartArray warning which this bundle brought us has been fixed in a recent update. After some very minor updates back in October that did not come with release notes it’s time for another round of updates to the ESXi HP extensions and other stuff. Unfortunately, we don’t seem to be getting release notes or general infos now either. 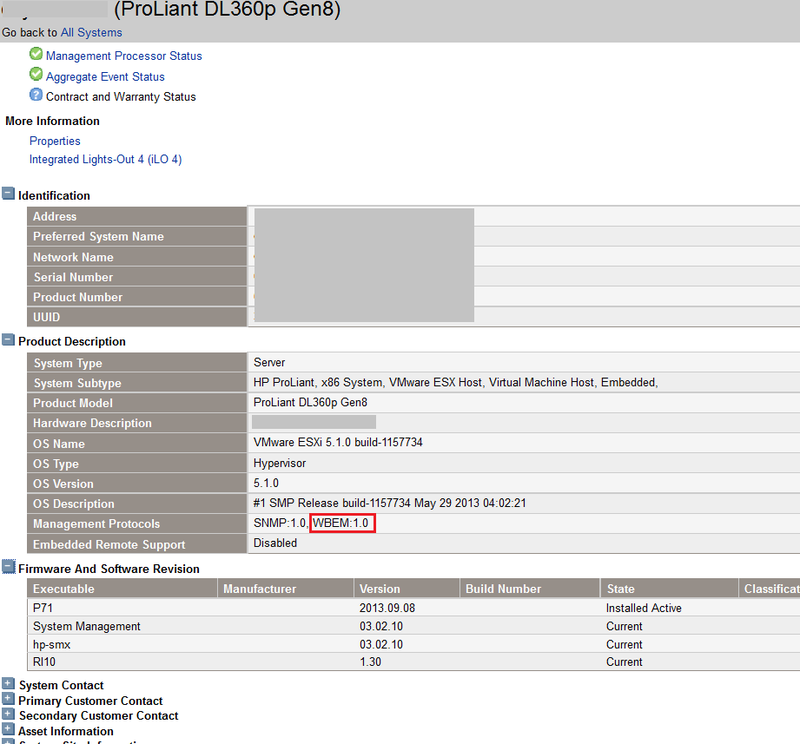 But these updates are publicly available on http://vibsdepot.hp.com/hpq/feb2013/ already and your VMware Update Manager should have already picked them up if you set it up to use the HP VIB depot. Since HP is so kind to not provide release notes, we can only guess about actual fixes or improvements, but we can at least check which of the VIBs contained in the offline bundles really do provide updates (spoiler: not that much). You may not always have the convenient option to install vendor-specific hardware management agents/extension on ESXi hosts or physical servers, for example with appliance-ish OSes like the Check Point SPLAT/Gaia platform (which is just a custom RHEL descendant), or you may run into a server without these tools installed. So how can you still query firmware information on such systems directly from the command line? I will outline a couple of ways here which make it possible to obtain that information. The example information captured here is from HP Proliant Servers (since G5), but most of it should work in similar ways with other hardware platforms too. Unless noted otherwise, the example commands here should work regardless of whether you have CIM providers or hardware management agents installed or not.